I guess I can say that I travel quite a bit. In 2012 I- and sometimes Leilani- traveled somewhere every month until about May/June.Seriously! It was great! We traveled to Boston, New Hampshire, Philadelphia, Virginia Beach, and Florida. However, as much as I enjoy traveling and will continue to do so as long as I can. I have learned that the best part about traveling is the places that traveling can take you personally. Every time I travel somewhere it’s like therapy. I learn more about myself, I gain a new sense of confidence, a new sense of direction, and a huge boost of confidence! As a child I would also say that I was going to live and work in D.C; so going to D.C with NLIRH was a dream come true! As was I there I experienced an extreme sense of “This is what I am meant to do,” my major is the right major, and I’m on the right track I just have to keep my head up and keep working hard. When I went back to D.C as a One Voicers with SIECUS,Advocates for Youth, and The Sirrea Club I met some AMAZING youth advocates from all over the world. They helped me realize that we are all working together, now, to create the world we want to live in. Leilani and I took a little walking tour all around Boston the first time we went. 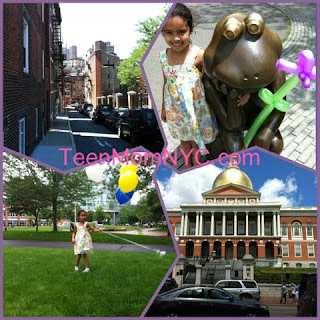 When I was in Boston for the MA Alliance On Teenage Pregnancy conference I had the most powerful personal travel experience to date. There at my good friendAlex’s house- another teen mom rocking life out- I realized: I am AMAZING and NO ONE can take that from me. When I realized that I wrote this post and that’swhen something inside of me changed and opened a whole new world of professional opportunities and ideas come to me. The Left is the City Hall Building- GORGEOUS! Then the temporary capital of the United States before D.C was created. When I went to Philadelphia with my two great friends and then Virginia Beach I felt like a “normal” young adult. Not a mom young adult,not a single teen mom college student, nothing but an average college student on a trip with her friends. Sure I called Leilani often, said good night to her and good morning but I was just me! 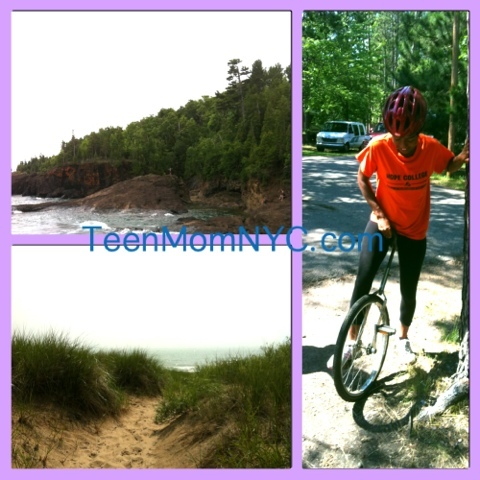 In fact the moment I realized that I could us my blog as away to help other teen and young moms was on vacation in Michigan. After biking a few miles and jumping into the icy cold waters of Lake Michigan, I came up out of the water shivering and cold but I figured “it” out. There are times when I’m here in the city, blocks away from my house and I realize that that moment right there on the smelly, nasty, loud subway is amazing because it is! It’s not about the physical destination that a trip takes you to, but the personal journey you embark on while you are there. So get out and explore! Explore your very own neighborhood! Getting More Free Time During the Weekend.